When there’s a high degree of automation, safety sensors are absolutely essential in ensuring the highest level of cost effectiveness and process safety. 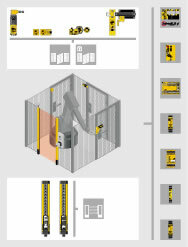 Used in conjunction with Pilz safe control technology, Pilz safe sensor technology PSEN provides cost efficient protection for man and machine, in compliance with the standards – for your success. Strict safety regulations now demand certain health and safety measures which protect people and machines from manipulation and failure. For this reason, modern safety sensors are absolutely essential. Compatible with our concept of safety for your machinery, PSEN sensors protect man and machine in accordance with strict standards. PSEN sensors are designed in compliance with international standards and regulations. Our safety sensors are certified by TÜV, UL and other international approval authorities. They ensure maximum safety for applications up to category 4 (EN 954-1) and are designed for application up to Performance Level E (according to ISO 13849-1) and SIL 3 (IEC 62061).